Born in Dhaka, Bangladesh. 1932 Founder member, The Young Artists Union and later Art Rebel Center, Calcutta. 1933 Assistant Secretary, Academy of Fine Arts, Calcutta. Graduated from Govt. School of Art, Calcutta. 1928 Annual Exhb., Nainital Art Club, Nainital. 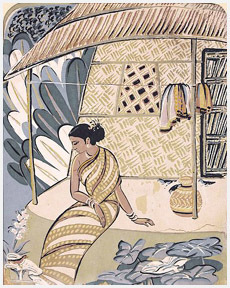 1933-34 Annual Exhb., Academy of Fine Arts, Calcutta. 1944 Annual Exhb., Bihar Silpakala Parishad, Patna. 1945, 46, 47 Annual Art Exhb., Bombay. 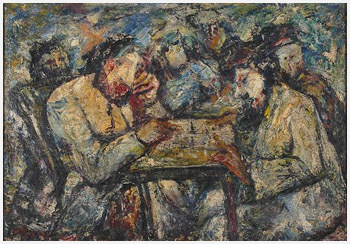 1946 Solo exhb., International Contemporary Art Exhb., Calcutta. 1948 17th Annual Exhb., AIFACS, New Delhi. 1952 Exhb. organised by Academy of Fine Arts, USA. 1952 Exhb., Cairo, Istanbul, Ankara and Baghdad. 1953 Exhb., Russia, Poland and West Germany. 1954 All India Art Exhb. organised by All India Peace Council. 1955 Silver Jubilee Exhb., AIFACS, New Delhi. 1956 All India Exhb. of Works of Art and Photographs of Wildlife, New Delhi. 1958 Exhb., Bulgaria. 1960 Solo exhb., Calcutta. 1961 Exhb., Cuba and New York. 1970 Solo exhb., Alberta. 1972 Solo exhb., Surrey Art Gallery, British Columbia. 1995 Old Masters, Taj Palace Intercontinental, New Delhi. 1998 Famed Yesteryears and Contemporary Indian Artists- 1857-1997, WWF and Art Konsult, New Delhi. 2002 Exhb. AIFACS, New Delhi. National Gallery of Modern Art, New Delhi. Lalit Kala Akademi, New Delhi. Ministry of Defence, Govt of India, New Delhi. Delhi Art Gallery, New Delhi. Awarded Govt. Scholarship, Govt. School of Art, Calcutta. 1928-29 First Prize, Annual Exhb., Nainital Art Club, Nainital. 1933-34 First Prize, Academy of Fine Arts, Calcutta. 1945, 46, 47 First Prize, Annual Exhb., Bombay Art Society, Bombay. 1949 Awarded Governor Generals Plaque, 18th Annual All India Art Exhb., AIFACS, New Delhi. One of the early Indian modernists, Abani Sen remained till the end an unswerving individualist, daring experimenter and a dedicated teacher. The various inflections of realism we find in Daumier, Czanne and Van Gogh, and the techniques of modern art, were all internalized and indigenized by him. His masterly handling of different media shows ceaseless interaction between the indigenous and the alien, the past and the present. 1948 Art Teacher, Raisina High School and Sarada Ukil School of Art, New Delhi.